Metal salts. 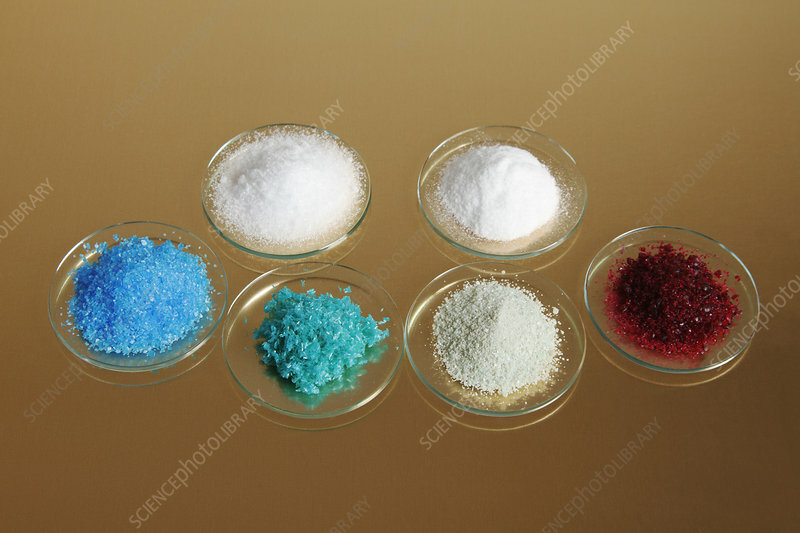 Front, coloured, left to right: copper(II) sulfate pentahydrate (CuSO4 5H20), copper(II) chloride dihydrate (CuCl2 2H20), iron(II) sulfate heptahydrate (FeSO4 7H2O), cobalt(II) chloride hexahydrate (CoCl2 6H2O). Back, white, left to right: zinc sulfate heptahydrate, hydrated aluminum sulfate. Transition metal salts are often coloured, with zinc salts being a notable exception.